SANPROBI Stress is a dietary supplement aimed at promoting a positive mood and combating physical and mental symptoms of stress. The product consists of a mixture of two strains of probiotic bacteria – Lactobacillus helveticus Rosell® - 52 and Bifidobacterium longum Rosell® - 175. Their positive effect on mental health has been scientifically proven and confirmed by clinical trials. The supplement is recommended especially for people who live in constant tension, are not very resistant to stress and have a problem with relaxing. The product works well in case of depressed mood and mild depressive-anxiety disorders. It is ideal for people who suffer from gastrointestinal disorders such as diarrhea, nausea and abdominal pain in situations of severe stress. Psychobiotics is a relatively new term. It was first used with the discovery that some probiotic bacteria may affect the intestinal-brain axis and beneficially affect mental well-being. They act through various mechanisms, both neuronal and endocrine as well as immunological. They help to maintain the integrity of the intestinal barrier, reduce the level of proinflammatory cytokines, they may also reduce the number of pathogenic bacteria producing toxins and other compounds, the excess of which correlates with the increase of anxiety and aggression. Lactobacillus helveticus Rosell® - 52 and Bifidobacterium longum Rosell® - 175 are two strains of probiotic bacteria recognized as safe for the body and the most effective of all psychobotics. They have been thoroughly examined in terms of the properties attributed to them, and their effectiveness has been confirmed in studies not only on animals but also on humans. The presented preparation contains a mixture of both strains. In clinical studies with the participation patients suffering from advanced depression, it was shown that the eight-week treatment with the combination of probiotic bacteria L. helveticus Rosell® - 52 and B. longum Rosell® - 175 resulted in a significant reduction in disease symptoms. The assessment was made using one of the most commonly used tools, i.e. Beck depression scale. In addition, all patients had a radical reduction in systemic inflammation, which in the light of the latest scientific reports correlates with the occurrence of mental disorders. Improvement in well-being was also observed in patients struggling with depressed mood and mild anxiety disorder. Volunteers who took a probiotic for a month reported significantly better mood and lowered anxiety. They showed greater self-confidence and coped with the problems, which before the implementation of probiotic therapy seemd too difficult to cope with. The same strains of probiotic bacteria were used in one study with the participation of people struggling with chronic fatigue syndrome (CFS). There was also a significant improvement in the majority of patients. People taking probiotics had more energy and willingness to take up activities; most of them got rid of the sleeping disorders and functioned better during the day. Supplementation with L. helveticus Rosell® - 52 and B. longum Rosell® - 175 can be recommended to patients with intestinal disorders. Specialists point to the correlation between inflammatory diseases of the intestines (ulcerative colitis, Leśniewski-Crohn's disease) and mental disorders (mainly depression-anxiety). In many patients, the symptoms of the disease exacerbate under the influence of stress. Regulating the activity of the gut-brain axis promotes remission of the disease. The L. helveticus Rosell® - 52 and B. longum Rosell® - 175 strains were tested not only in respect of the afflicted people. Their impact on healthy people was also checked. The obtained results provide solid premises for the implementation of supplementation during periods of severe stress. Many people experience gastric problems under the influence of stress factors. The most common complaints are abdominal pain, digestive discomfort, diarrhea or nausea. Supplementation with SANPROBI Stress may help in getting rid of this type of ailments. The study proved that people who for a month took a probiotic based on the combination of L. helveticus Rosell® - 52 and B. longum Rosell® coped better with everyday problems, solved problems more quickly, and less often experienced feelings of anxiety or irritability that usually accompanied them in stressful situations. Researchers also suggest that psychobiotics promote relaxation. They are especially recommended for people who live in constant tension and have problems with relaxing. The presented preparation may help to achieve the desired mental peace. In many cases, it will be also helpful in anxiety-induced sleeping disorders. In summary, SANPROBI Stress is a unique supplement that uses the digestive system to promote good mood and mental health. The preparation is based on two thoroughly tested strains of bacteria from the group of psychobotics. It has been scientifically proven that colonizing the gastrointestinal tract with them effectively combats the physical and mental symptoms of stress, reduces anxiety and alleviates the symptoms of depression. Take 1 capsule daily with or without food. In the case of using in young children, you can open the capsule and dissolve its contents in cold or lukewarm liquid (e.g. water, tea or milk). The product should be consumed immediately after preparation. The supplement can be used by adults as well as by children who have reached the age of three. Prophylactically, use 1 capsule a day. The presence of food does not affect the absorption of the preparation, so it can be taken with or without food. It is important not to drink capsules with hot water, as it can deactivate probiotic bacteria. The preparation is recommended especially for people who are not very resistant to stress and under the influence of stress factors suffer from annoying digestive ailments, such as diarrhea, nausea, abdominal pain. 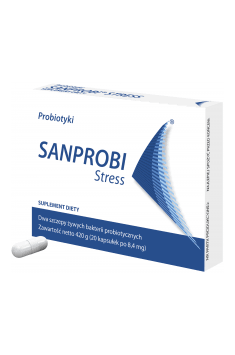 SANPROBI – Polish manufacturer of probiotics designed for people who want to maintain the correct working of the gastrointestinal tract, and naturally support the immune processes in the body. As well as for people who are physically active, including professional athletes. Sanprobi probiotics free of gluten and dairy-derived substances. They have recommendations of gastroenterologists and specialists of nutrition and healthy Llfestyle. Carrier - potato starch; carrier - magnesium salts of fatty acids; capsule shell: hydroxypropyl methylcellulose. Lactobacillus helveticus – what is it? Lactobacillus helveticus are lactic acid rods which show probiotic effects, that is they bring benefits for the human body system. It is commonly used in the production of cheeses, to prevent bitterness and produce nutty flavours. In supplements, it is used to support digestion and absorption of nutrients, raise immunity and fight pathogenic bacteria in the digestive system. It can potentially decrease blood pressure, reduce high concentration of cortisol, which is associated with stress response, and even have anticancer properties. It is believed that L. helveticus can have positive influence on general well-being. An interesting advantage is also improvement in sleep quality caused by probiotic.